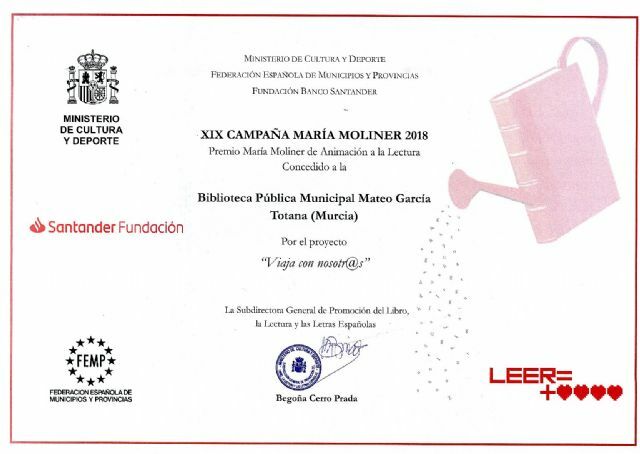 Totana.net - The municipal library has been one of the winners of the XIX Reading Animation Campaign "María Moliner 2018" for its project to promote reading "Travel with us"
The municipal library has been one of the winners of the XIX Reading Animation Campaign "María Moliner 2018" for its project to promote reading "Travel with us"
The municipal library "Mateo García" has been one of the winners of the XIX Reading Animation Campaign "María Moliner 2018" for its project to promote reading "Travel with us", endowed with 1,706 euros for the purchase of books for the library. This has been recently reported to the Mayor's Office by the General Subdirectorate for the Promotion of Books, Reading and Spanish Literature of the General Directorate of Book and Reading Promotion of the Ministry of Culture and Sports. According to the call, this grant will be used exclusively for the acquisition of books for the library, and its selection must be made by the staff of the municipal service according to the needs and with the objective of completing and improving their funds. The Councilor for Culture, Eulalia Moreno, has shown her satisfaction and congratulated the municipal service techniques for the quality of the project presented, which comes to distinguish the work and commitment to culture to serve as a stimulus for this municipality to continue encouraging reading. The municipal public library returned this year in the call directed to municipalities of less than 50,000 inhabitants, through the Ministry of Culture. Through this campaign, the best projects or reading dynamization activities developed in their libraries are rewarded, with the aim of encouraging reading among all social groups, especially among children and young people, which form the basis of future adult readers. This selection of books is also intended as a sample of literary production and current illustration. With this action, small municipalities are encouraged and work is developed to promote reading in places where there is usually a difficult access to books, explained the mayor of Education and Culture. This program is of great strategic importance, since approximately half of the Spanish population lives in municipalities of less than 50,000 inhabitants, which is why this initiative is intended to generate a great impact on the territory.